Hurricane Harvey has now evolved into a 1000 year flood for large areas of East Texas. Even today this superstorm has already attained a catastrophe status of truly epic proportions…and it still has days of rain-dumping predicted. Truly, this calamity will prove to be the worst manmade weather event in Texas history. The common folk all over Texas are even referring to Hurricane Harvey as a once-in-a-millennium biblical event—H A R V E Y G E D D O N ! How does such a disastrous deluge come out of nowhere and catch so many completely unaware? Even the U.S. Federal Government, Texas State Government and Houston Municipal Government appear to have been blindsided. This simple fact — when a superstorm seemingly comes out of nowhere — it’s often the sure sign of a geoengineered weather system. For those who doubt that this catastrophe was manufactured, please view the following video. With this critical understanding, the reader can more easily apprehend the true purposes behind Hurricane Harvey as delineated at this link: Hurricane Harvey: A Geoengineered Superstorm Targets Texas—WHY? 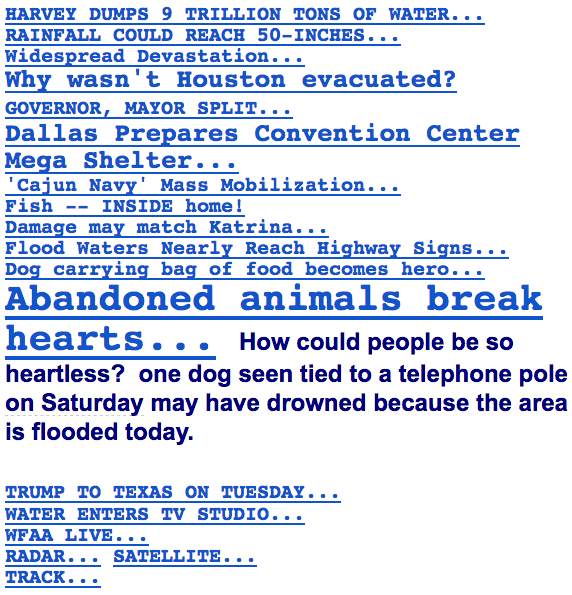 As far as the extensive and profound destruction of this devastating rain event, these headlines from the Drudge Report capture just a small piece of this unfolding geoengineered tragedy. What is particularly concerning is that the following list of extreme headlines only represent the tip of the iceberg. Harvey has not been kind to Houston Highways & Byways. 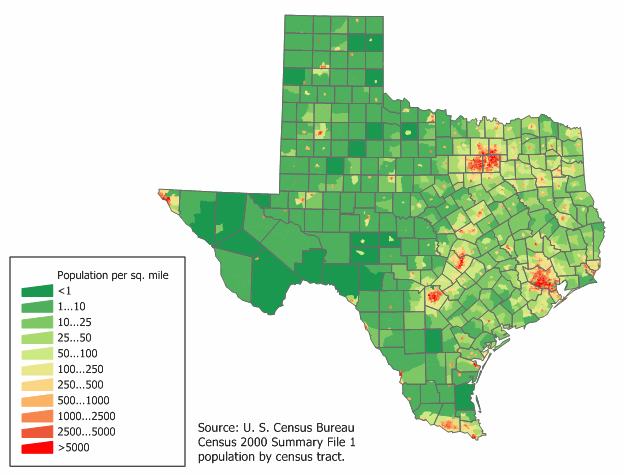 The population density of East Texas is very high compared to the rest of the state, which is the second most populous state in the country (see graphic below). Hence, it is not just Houston and Corpus Christi that have major problems; it’s the whole region, especially the outlying and many low-lying residential areas. The biggest concern is that this superstorm is a HUGE rainmaker which has essentially parked itself over the East Texas lowlands. The grim reality is that Houston, like New Orleans, shouldn’t even be there, its elevation is so low in many places. There’s no question that Hurricane Harvey was geoengineered by the usual perps specifically to morph into President Trump’s Katrina. Like all conspiratorial plots concocted by Deep State, this one will quickly unwind as swiftly as the floodwaters recede. Until then, the perpetrators will do everything in their power to take advantage of the chaos they engineered in Houston, in Corpus Christi, in the capital Austin, and elsewhere throughout southeast Texas. There is much more going on with this manmade deluge than meets the eye. Some of the deeper intentions are impossible to tease out at this early stage of the rapidly evolving crisis. Nevertheless, the Alt Media is watching every phase of this deliberate weather event very closely. Their fingerprints (e.g. geoengineers, FEMA operatives, agents of Deep State) are unavoidably left all over the crime scene, as usual. As for the many seemingly disparate goals of the NWO globalist cabal which directed this weather drama, the following exposé breaks it all down. 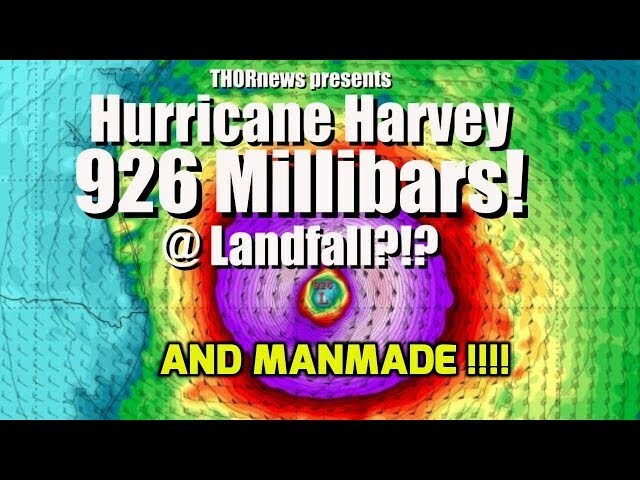 Hurricane Harvey Geoengineered! Havoc Created by the Usual Suspects. Why Texas? Another primary reason for the perpetration of H A R V E Y G E D D O N against the Trump Administration at this critical point is to intensely distract the White House. Deep State knows that Trump is not a Bush and will do everything in his power not to let “Harvey” become his “Katrina”. Team Trump is at a crucial point in their process of discovery with respect to Obama-era crimes and Clinton corruption. The DOJ has kept the lid on many serious investigations any one of which can translate to a full-blown criminal prosecution in a Washington moment. The U.S. Intelligence Community is particularly vulnerable to being exposed for their multi-decade crime spree. Trump knows that he really has no choice but to take his wrecking ball to Deep State. Therefore, the most high-profile agents of Deep State are feeling the heat like never before. No POTUS in American history has ever taken the mainstream media to task for their utterly fake news production. With each passing day, Team Trump and Deep State are getting perilously closer to a full-scale “War of the Titans” scenario. KEY POINT: In order to avert such an unparalleled public spectacle and political bloodbath, the NWO cabal geoengineered Hurricane Harvey. What better way for the globalists to divert the attention on them to the storm-drenched people of Texas. The whole nation is now transfixed by this ongoing disaster. The power elite always creates these extreme predicaments to change the conversation. When half the USA wants international criminal George Soros arrested yesterday, imprisoned today, and hung for treason tomorrow, TPTB know that they have serious problems. Much more serious, in fact, than Houston’s. This is why the elites engage in misdirection at every turn of events—they are facing very real existential threats. Of course, so is President Trump, but at least he has the military, law enforcement, state militias, and citizen gun owners squarely on his side. • Texas has resisted every attempt by the United Nations to diminish its sovereignty. Every UN scheme to exert any supranational power over the state of Texas has met stiff resistance. This is especially true where it concerns illegal immigration. The UN has become so determined to foist illegal aliens on the state of Texas that they are now going after the Trump administration. UN Threatens Trump: Stop Detaining Illegal Aliens or Else! In this particular instance, HARVEYGEDDON has served as a monstrous weather threat, which hangs over the state like the Sword of Damocles (SOD). • The secessionist movement in Texas gained a lot of steam under Obama’s tyranny. While that has lessened under Trump’s presidency, the state has not relented in taking several initiatives to firm up its financial independence. Not only has Governor Greg Abbott demanded their gold from the New York Federal Reserve Bank, Austin is now the home to the new gold vault. It’s Official: Texas Builds The Nation’s First State Gold Bullion Depository Nothing irks the globalists more than the prospect of a gold-backed currency, especially one that could be used by a newly declared sovereign “nation-state”. Again, the SOD hangs precariously over Austin to cease and desist such defiance via an all-out weather war. • Then there is the UN’s overarching agenda to bring Texas in line with California with respect to their global action plan to supposedly save the planetary environment. This is where the NWO controllers will not hesitate to wreck and ruin the environment in order to save it. In other words: to destroy East Texas so that Austin will bend to the will of the globalists who want to implement Agenda 21 everywhere on the planet—24/7. The same Hurricane Harvey perps also want to carry out their 2030 Agenda for Sustainable Development worldwide, which is lagging way behind schedule because of steadfast states like Texas who obstruct it. 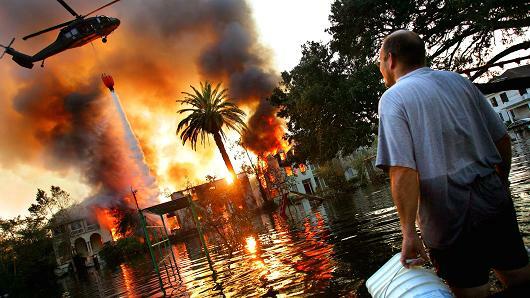 There are several other reasons for the now infamous HARVEYGEDDON which are way beyond the scope of this article. However, each of those is vital to fully comprehend the depth and breadth of this incomparable psyop perpetrated by the Illuminati. Weather warfare on this scale has simply never been seen before on the U.S. mainland; nor has such overwhelming environmental terrorism. Hence, those other globalist purposes will be discussed in a future exposé. 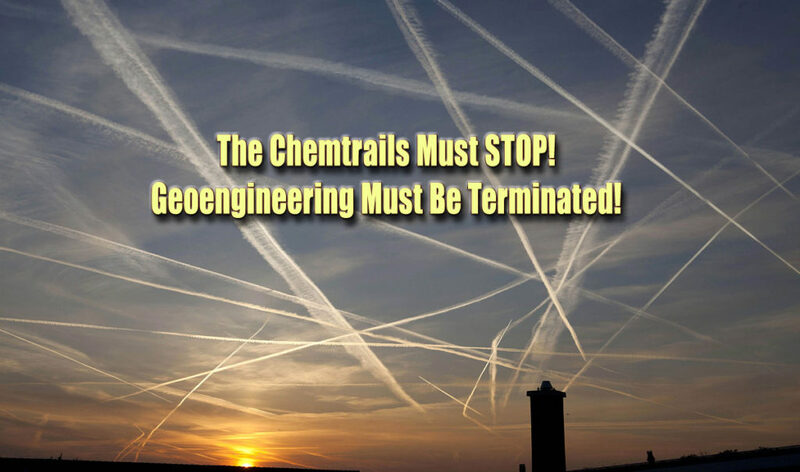 Letters have been written and sent directly to President Trump and his key staff regarding the dire consequences of geoengineering (see links below). These requests to stop the chemtrails have not been addressed or even acknowledged. Quite unfortunately for the residents of Texas, our warnings were not heeded.